Go ahead and fill 'er up. A neighborhood lady looked out her window to see their large dog walking about the yard with something in its mouth. 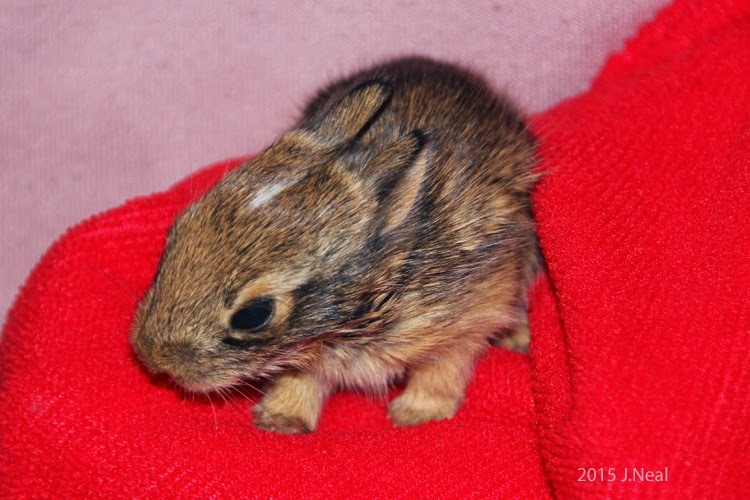 She went outside to investigate, and found the dog carrying a roughly week-old rabbit. There were no other rabbits about, nor any indication where it had come from. She took the bunny and put it back on the ground, but then saw a bunch of cats assembling. The small creature could not expect such gentle handling from the felines, so the woman and her husband brought the rabbit to Jean. Jean started the bunny on PetAg’s KMR (Kitten Milk Replacer), which she served every three hours with a curved-tip Monoject feeding syringe. 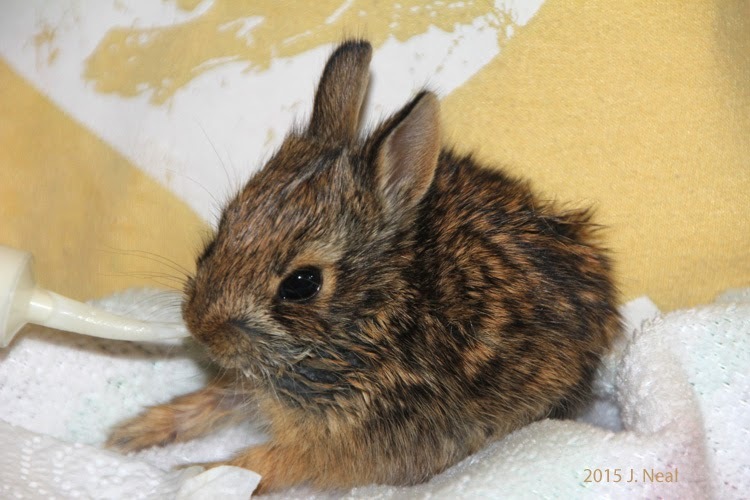 For the first week, the bunny lived in a heated tub with two young squirrels that Jean is also rescuing. Neither the rabbit’s nor squirrels’ eyes were open yet, but they constantly found each other, and all three stayed huddled in a ball. The rabbit knew enough to claim the warmest spot by sandwiching itself between the two squirrels. After a week, they were separated when the rabbit began to experiment with solid food. The experimenting was quickly over, and the rabbit’s growth spurt turned nibbling into a voracious appetite. It would start at one end of a piece of Romaine lettuce, carrot, apple, or celery and just keep chomping until it had inhaled the whole piece. A couple times it was found to have contentedly fallen asleep with a piece of celery still sticking out of its mouth. Besides the fresh produce and Timothy hay, it also began to learn what the rabbit pellets were for, and has doubled its weight in two weeks.